UV resistant to sunlight. Low tension properties of high density polyethylene allows for a smooth turning valve stems that does not require lubricants. Ideal for low pressure applications to 45 psi. 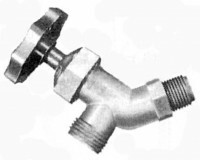 For higher pressure applications, tubing can be clamped onto the vavle stems. Smallest valve QF-INV1 fits aquarium tubing.